You should ensure that TDS certificates (Form 16/16A) issued to you are downloaded only from TRACES (TDS Reconciliation Analysis and Correction Enabling System of the Income tax department). Certificates downloaded from TRACES are in a specific format. A form downloaded from TRACES would bear a 7 character alphabet unique certificate number and it will also have a TDS- CPS logo on the left side and a national emblem on the right side at the top. This certificate would provide the details of the income paid to you and also the tax deducted from that income by the payer and whether the same has been deposited by him with the government. 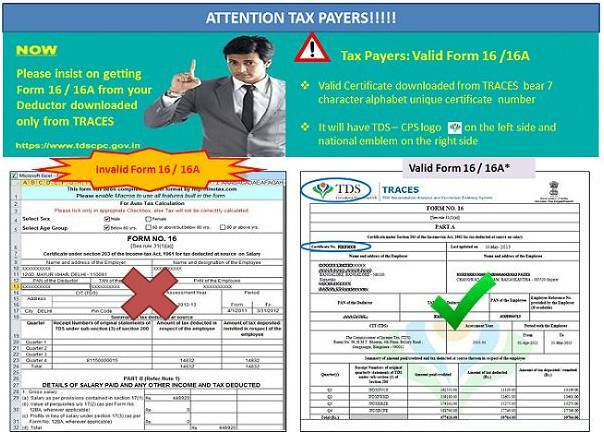 See below for a sample of how a valid TDS certificate in Form 16 or Form 16A should look. An annual tax credit statement is generated by the income tax department for a person subjected to TDS (deductee) in Form 26AS. The statement provides details such as name of the deductee, PAN of deductee, details of deductor, the TDS amount, the amount of TDS deposited with the Government by the deductor etc. The user can download the statement from the income tax e-filing website. The downloaded statement is password protected and the password to open the file is the Date of birth of the user which he would have entered when registering with the income tax e-filing site. According to practicing chartered accountants, the income tax department normally cross checks the taxes claimed as TDS or as paid by you in your return with those showing in Form 26AS. "Therefore, in case certain taxes claimed as deducted or paid by you in your return are not reflected in the Form 26AS then you may get a notice from the tax department when it processes your return" says Chartered Accountant Anil Kapur, Partner, AVAN & Associates.